ABC Marquees offer a selection of wedding venues and packages that can help to make your wedding more affordable … without shortening the guest list or scrimping on the catering! Excuse me for stating the obvious, but planning a wedding is not cheap. And who would want it to be? But wise choices can help to save the pennies (to spend on your honeymoon?) and still thoroughly enjoy The Best Day Of Your Life. 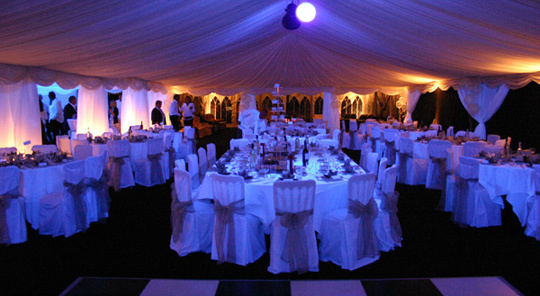 Book a Wedding Marquee Venue! A beautifully furnished wedding marquee can be as luxurious as a fancy hotel or country house, yet is often far more spacious AND affordable. With marquee linings, atmospheric lighting and chandeliers plus a range of beautiful themes for your marquee and table settings, you will be able to easily create the ideal wedding venue from our range of accessories, or even design and create your own unique theme. We can create lounge areas as well as the bar, dining area, staging and dance floor, and our luxury toilet hire will provide the utmost comfort for your guests from day to night. ABC has a selection of wedding marquee venues to hire in the Sussex countryside which offer great value for money, including Wivelsden Lakes – our own ideal “Festival Wedding” venue – just 15 miles from Brighton. The marquee is positioned overlooking a lake with beautiful surroundings for your wedding photographs and overnight camping available on request. If you have already chosen an indoor wedding venue, wedding marquee hire can give you and your guests more space – for dining, dancing or simply relaxing – and ensure you are able to invite ALL your family and friends to the reception! Book a Winter or Spring Wedding! An excellent way to secure savings on your wedding costs is to get married out-of-season; this can be any time from September to April and can often gain you fantastic discounts on the wedding venue, catering and most definitely the marquee hire and furnishings! It may also mean less of your guests will be away on their summer holidays. Our wedding marquees are available with flooring, carpet, marquee linings and heating, so there’s no need to be afraid of the chill factor. Plus we’re already planning a special budget wedding package for next year where Winter comforts will be available with great savings! If you have selected a Winter or Spring date, don’t be afraid to ask suppliers about seasonal wedding packages, discounts and special offers. At ABC, we will be delighted to assist with your wedding planning and do everything we can to help make the most of your wedding budget. Please check out our excellent Marquee Wedding Venues or get in touch to discuss your ideas!